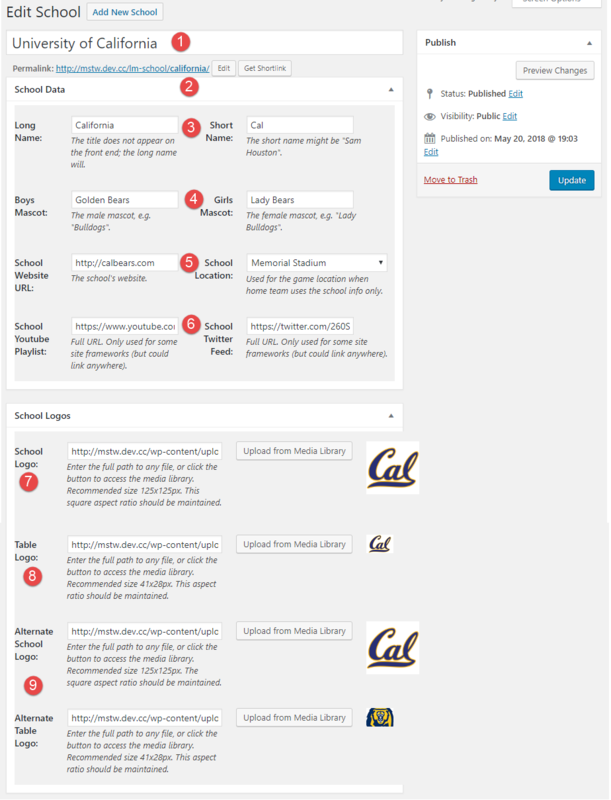 The Schools database is a way to reduce your data entry load for teams, and simplify changes to the basic properties of teams by simply linking a team to a school. Previously with MSTW League Manager a lot of duplicate information had to be entered for teams in the same school. Now with the MSTW League Manager Add-ons, you can assign a team to a school and eliminate much of the required data entry. The Schools admin menu item will display a list of Schools as shown in the image below. Either click the Add New School button at the top of the screen, or select one of the existing schools to edit it. A screen similar to that shown below will appear. 1. Title: The title does not appear on the front end displays, So you can design it to better organize lists on your admin screens. 2. Permalink: The permalink will default to a “permalink version” of the title. You can change/shorten it if you wish, but it’s recommended that you do so before using the school on your site. 3. Long & Short Name: While the front end display formats are somewhat configurable, the following general guidelines apply. The long name is used most frequently. Be aware of space limitations to prevent names from being truncated. For example, the school’s title might be “The University of Southern California”, but the long name might be “Southern California” or even “USC”. Why? “The University of Southern California Trojans” is probably not going to fit on most front end displays. “Southern California Trojans” has a better chance, but might not either. “USC Trojans” probably will fit. The short name is used on “tickers” where space is limited, and therefore should be not more than 4 characters, and generally all caps. 4. Mascots: Enter a male and female mascot as needed. The plugin will determine which one is correct on any given front end display. 5. School Location: The school location is pulled from the Venues/Locations database. You probably want to create something generic for the school location, like school name and address, even just city and state. 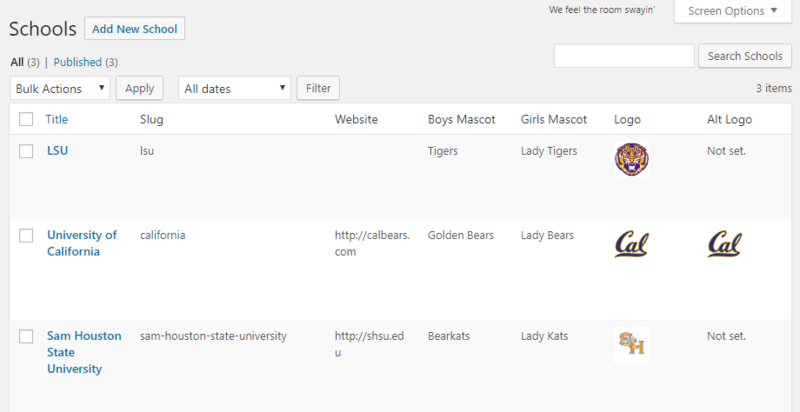 In the screenshot, “Memorial Stadium”, which was added for Cal football, is probably not appropriate for women’s basketball. 6. YouTube Playlist and Twitter Feed: These fields are not currently used by the plugin or its shortcodes. They are used in some custom frameworks, and they may be incorporated more directly into the plugin in the future. 7. School Logo: This is the main logo for the school, and is used in several front end displays. The recommended size is 125px x 125px. Other sizes may work well, but if you deviate from a square aspect ratio expect some distortion. 8. Table Logo: This logo is used primarily in tables. The recommended size is 41px x 28px. (Don’t ask.) If you deviate from this size, you may be okay if you maintain the aspect ratio. 9. Alternate Logos: These are not currently used, but they will be at some point in the future.